Free tasks and results are now available from the ArcGIS Explorer Resource Center. In conjunction with the December 2007 release of ArcGIS Explorer build 440, the ArcGIS Explorer Resource Center has been expanded and now includes results and tasks that users can add directly to their maps. It also makes it easy for users to share their own tasks and results with others. ArcGIS Explorer is a free, lightweight, downloadable application that offers a simple way to access online GIS content and capabilities. It supports a variety of 2D and 3D mapping services, as well as geoprocessing services for spatial analysis. Users can employ ArcGIS Explorer to access and fuse any standard Web service, including those from ArcGIS Server, ArcIMS, and Web Map Service (WMS). These services can also be integrated with users' local data and imagery. ArcGIS Explorer tasks are actions that users can perform on their maps. Tasks now freely available on the ArcGIS Explorer Resource Center include a Wikipedia Search that can be used to locate information about a selected point on the map; a weather finder; a Find Nearby task that helps users locate specified features, such as restaurants, schools, parks, churches, etc., near a selected point; and business reports that can be used to create demographic and expenditure reports for anywhere in the United States. Results that are now freely available from the ArcGIS Explorer Resource Center include U.S. state highest and lowest points; U.S. national parks; and U.S. state capitals and facts, with links to the USGS Science In Your Backyard site. The ArcGIS Explorer Resource Center also continues to provide basemaps and layers to help users customize their maps and to act as a meaningful backdrop to their own data. To encourage greater sharing of information among ArcGIS Explorer users, the Resource Center now also gives users a way to submit their own projects to the Resource Center Showcase. Once they have submitted their project, others can add these shared NMF files to their own projects. 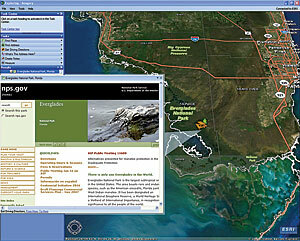 The ArcGIS Explorer Resource Center is located at resources.arcgis.com. For more information about ArcGIS Explorer and to download the free ArcGIS Explorer software, visit www.esri.com/arcgisexplorer. The use of GIS technology is exploding in business and education. Esri, the leading provider of GIS software, has launched a free Web-based GIS tool called ArcWeb Explorer. Listen in to this short conversation with George Dailey, Esri Education Solutions Team, about GIS and mapping from the vendor hall at TCEA.